It was one of “those” mornings. Despite all my efforts to ease into my daily routine, I was greeted right out of the gate by a needy to-do list. The laundry basket on the verge of overflow. An urgent email awaiting my response. That issue of aphids on my rose bushes just begging for a Google solution. My bible lay on the coffee table seemingly staring me down. It was “that” moment, when priority and desire lock horns and wrestle for your time. For as long as I’ve been a believer, I’ve searched for the perfect pattern to choosing God over all else—even incoherent morning brain and a sink full of breakfast dishes. There are plenty of formulas out there. Many wise and well-intentioned individuals have penned their ABC’s to meeting God and 5 steps to the best quiet time ever. Yet every “how-to” pattern only shines a spotlight on how I can’t. There have been many mornings in my 20+ years of faith when I’ve beaten myself up for falling short. Motivated by shame, I’ve tiptoed into God’s throne room around noon convinced He was entirely disappointed that I once more broke the rules and cleaned the kitchen before I cracked open my bible. When God gave me “seek” as my word for 2017, I decided to delve into how I did just that—seek God. It wasn’t the method [how-to] I wanted to discover, as much as the motivation [why] behind my pursuit of Him. So I asked God: Am I doing it wrong? Am I doing it right? Am I thinking I’m doing it wrong when I’m actually doing it right? The real question: Was I failing God? Just as quickly as that thought rolled across my mind, the answer followed. For you who also review the “rule book” and conclude you’re getting it all wrong, can I offer you this assurance: you’re not. Maybe you need that reminder too … that offering from a gospel wrought with mercy, grace, and the promise that God is STILL good to those who diligently seek Him … even at noon, even after they pick up the toys strewn across the floor. Our salvation is not determined by some subjective set of rules. We are saved by grace alone. salvation = grace + faith and nothing more. We don’t impress God by setting rules and creating checklists—that’s just a bunch of how-to. Our devotion to God is reflected in our faith, strengthened through His grace, and demonstrated by actions motivated by love, not obligation. That’s the why that matters. Is it not clear to you that to go back to that old rule-keeping, peer-pleasing religion would be an abandonment of everything personal and free in my relationship with God? I refuse to do that, to repudiate God’s grace. Structure and patterns are great, but grace is greater. We can’t render what works for someone else as written for us. Our goal should not be to please those who provide well-meaning suggestions, when we have a God who meets us with His perfect truth. You know what God showed me? I don’t do mornings. I also don’t do chaos or disorder. I cannot leave the bed unmade, step over crumbs on the kitchen floor, or ignore the cereal bowl left on the coffee table with a teaspoon of milk and one cheerio. Those are not things to shrug at on my way to God. They are distractions that will peck at the front of my brain when I attempt to turn my devotion and attention upward. But they are not failures. God has not written “failure” over us, so don’t believe that lie. It has taken me a lot of work to choose grace, and the irony of that is not lost on me. But, there is sweet freedom in knowing that God isn’t standing over our shoulder with a clipboard. We don’t have to work harder. God isn’t demanding one more thing in order for us to be made righteous and whole. If you’re anything like me, you need those friendly nudges that grace rewrites the rules. It’s something beautiful we should insert into every day. I’ve created this takeaway just for you! Feel free to print it and tuck it into your bible, or pin it to share and save for later. You can also find these words linked up at my favorite spots: Jennifer Dukes Lee, Holley Gerth, Kristin Hill Taylor, 3dlessons4life, Heart Encouragement Thursday, and Arabah Joy’s Grace & Truth. I love this Tiffany and am so glad I clicked on over! We like to make it about the rules and our works, don’t we? I’m so grateful that it’s HIS grace alone!!! Love your printable, Tiffany. It’s so good to remember that GRACE is greater than all my failures and mess-ups. Greater than my legalism and failed good intentions. Thanks for this encouragement. So glad you like the printable. I don’t do very many, but felt like this was a good place to start. We can always use more reminders about His amazing grace! I am not a fan of mornings either and have beat myself up over it too. Why do we think we have to do everything a certain way? If God was a teenage girl, He would be rolling His eyes at us! Haha…so true. In fact, I’m pretty sure He rolls His eyes at me everyday…in the most loving way possible. ;) Thanks for being here, Sarah. Love this. So true. How many sermons have I heard about starting the day with x- amount of minutes of quiet time? How many things have I read outlining the steps to the perfect quiet time. But life is not this formalistic, especially with little ones and life rushing past. I am like you, I need some peace and order before I can turn my mind to important spiritual things. So let’s quit beating ourselves up and adopt your quiet time rules. Better five minutes happily meditating on the scripture while nursing, than one hour spent in quiet time just to cross it off our to-do list and gain extra points with God. Grace. God want a real relationship with us, not a guilt induced relationship with strict rules we impose on him and us. Thanks for the freeing and grace filled message. Preach, Theresa and amen!! I grew up under those quiet time rules of needing a chair, a basket, 3 commentaries and 2 highlighters. 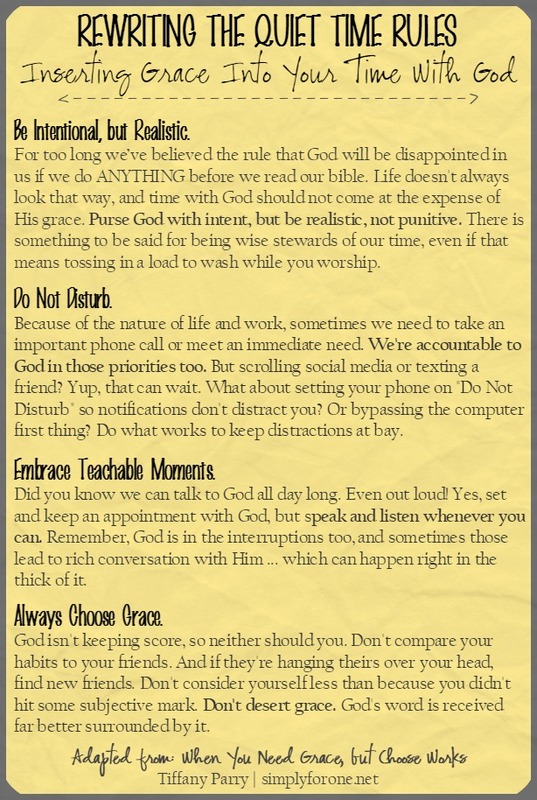 I even promoted those “rules.” Oh, so exhausting and they just wring all the sweetness out of our time with God. I’m with you – better 5 meaningful minutes than a checklist of rules. So glad you joined the conversation. Tiffany- I loved this. I need order to in the morning, so I tend to it all and then find Jesus someway along the day. Thank you for the reminder of His grace and mercy which extends each day to us, especially on the days I choose something other than Him. So glad I’m not the only one who needs some order in the AM. I love that we always find Jesus when we look for Him. Tiffany, these words just exhale grace and rest from yokes of our own making. There have been seasons of mothering where I was on 24/7 … there was no true night-time and morning time. In those days, it was all I could do to put God first when I had my first chance to read. I’ll be sharing this friend! Thank you, Lisa. Yes – we can certainly wrap ourselves up in chains. So grateful for the freedom and grace found in Jesus. Oh girl, I so get you. I can’t tell you how many times the exact same morning has played out and I’ve had the same thoughts. Thank you for this. We can never hear this message too many times. Love it and you! Agreed – I need those “it’s going to be okay” reminders all the time! Love you back. Dear Tiffany, Thank you for these great reminders today. I find myself being the one “carrying that clipboard around,” even when I know that GRACE isn’t like that! When those lists were such an ingrained part of my day, it’s so easy to want to slip back into the old ways. I’m so thankful that God never gives up, and He finds ways to make sure I remember that it’s Grace that will lead me home. I so appreciate your good word today! –Blessings to you! Beautiful, Bettie – grace does lead us home. So grateful that when we ask, God will keep grace ever before our eyes. Blessings to you as well, and thank you for being here. Thank you, thank you. The grace you shared is the grace I am in need of! Praise God for loving us at all times, in all seasons, no matter what we do and are. I am so grateful. So glad the words met you, Linda. I’m so grateful for grace too. I can’t do my God time first thing either, or I fall back asleep…but I do have to do it before my kids get up, or it doesn’t happen at all! So I wake up super early and work on my writing for an hour to wake me up. :D I think Bible college was the most frustrating, because that’s when I was the busiest: 21 credit hours, graduating early, engaged, and working two jobs…I’d end up doing my Bible time at midnight in the dorm room bathroom! So now waking up a little early’s not so bad…. I remember navigating that too when my son was little, even having him sit at the table with me while I tried to steal that time. Yes – busyness can get the best of us, so I’m grateful that God meets us no matter what time we make our way to Him. It’s that we do that matters. Thanks for visiting today, Liz. Such a good post, Tiffany. We can so beat ourselves up on this one. Yet God is looking for us to be relational and with a heart that is fully present with Him. If we meet with Him just to check off another box, often it is done out of habit and our hearts or minds are off thinking about other things. I am so glad He is flexible and meets me right where I am each day. Such truth, Joanne – that fully present heart is the one He is after. So glad God gives me grace to shove aside all distraction before I sink into Him. Thanks for joining the conversation today! Such relief to know that grace trumps our failures every, single time…thank you for this much-needed reminder today. Amen and thank YOU for being here, Cheryl. Hello, friend. Your words always press deep. They’re authentic and that shines brightly. It must mean you’re understanding “seek” well. By the way, there’s a beautiful sense of peace and calm here at your blog. Every.single.time I land here. Love it! So many times God reminds me of Romans 8:1 – that there is no condemnation for us in Christ Jesus. Coming from a legalistic background, it’s hard sometimes not to feel guilty. But as you say – “God isn’t demanding one more thing in order for us to be made righteous and whole.” Amen! Thank you for this encouraging reminder, Tiffany! Love and hugs to you! Oh, yes, Tiffany. You know I can relate to this message – and it’s one my heart needs over and over and over again. That verse from Galatians 2:16 is perfect. Thanks for sharing this and linking up at #ThreeWordWednesday. Love those reminders of what we re-forget. I need them all the time too!! I love grace. Really, really love it. And I’m learning to take it in like a small child. God never tires of giving us grace and the more we seek Him and that grace the happier we all become. So grateful I can come to Him as a child! Yes, Becky! It seems the longer I walk with God the more I realize I need to come to Him small, humble and teachable. So grateful that His grace supply never runs dry. Thank you for visiting today. So glad for this, Tiffany! I love that your focus this year is on a “why” not a “how.” Scripture is so clear that God weighs our motives and looks at the heart. I’m so grateful for His grace- and also that because He knows us and cares more about our intentions- He can perfectly teach us how to best glorify Him according to how He uniquely made us! And I’m extra grateful we’re saved whether or not we “do well” with our intentions or our works!! Me too, Bethany – grateful that He is a God who has knit together and knows our innermost workings. In my case, that means I need constant reminders and He is so faithful, in His grace, to keep teaching me. Thank you for joining the conversation today. I always love hearing from you. You are not alone working toward choosing grace. It’s something I’ve struggled with all my life. I always knew God was real, but didn’t know anything about real faith or grace. When I accepted His grace it was like an explosion in my chest…. I know it sounds corny, but that’s the best description I can find for it. Great post, thanks for sharing. That doesn’t sound corny at all. Grace changes things in the most amazing ways! Thanks for stopping by today. Beautiful truths here, friend. And there’s yet another thing we have in common: I can’t concentrate in the midst of chaos. Thank goodness God extends the grace that makes it okay for me to straighten before I spend time with Him. So I can devote all of myself to that time with Him. :) In fact, as I write this, I’m seeing a few things I can put away right now to make a little more order in my home and my spirit. Thanks for the reminder that God’s grace extends to every area of my heart and life. Your quiet wisdom blessed me this morning! Hello, sweet friend. You’ve been on my heart often and I’m so glad you visited. Not shocking at all that we both like tidiness around us. Doesn’t it just make it so much easier to focus on what counts?! That’s how God made me, and I’m so grateful He reminds me of His grace toward me and all my little quirks. Big hugs to you! I love that God created our hearts, our make-up, and our uniqueness so he understands all of our quarks; He gets us, he isn’t condemning us. Psalms 33:15 “He made their hearts, so he understands everything they do.” That verse does my heart good, so does His grace, and your post!